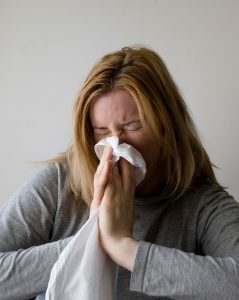 Cold and flu season is right around the corner, and you want to avoid it at all costs. These 5 smart cold and flu prevention tips will help keep you healthy. Do you remember how bad last year’s flu season was? In fact, some 80,000 Americans died from the flu or complications of the flu, making last winter the deadliest in that regard since the 1970s. As the weather turns chillier, cold and flu season is upon us once again. That means it’s time to take steps to keep yourself and your family health. Read on to learn the top five cold and flu prevention tips! Let’s get this out of the way, right off the bat: you cannot contract the flu by getting a flu shot. The vaccination does not contain the live virus. It can take two weeks for the antibodies to build up in your system, however — so if you come down with the flu after receiving a shot, chalk it up to bad timing. Of course, it’s also possible to be infected by a different strain of the flu than the ones for which the vaccination was developed. Even if you do get sick, the flu shot can help shorten the duration of your illness. So get the shot, as early in the season as possible. The simplest way to prevent colds and flu, bar none, is good hand washing hygiene. Wash your hands thoroughly before handling food, after using the toilet, after touching an animal, after handling garbage, and after you sneeze, cough, or blow your nose. Don’t have access to running water and soap? Use a hand sanitizer that contains at least 60% alcohol. Please note that hand sanitizers do not kill all the germs on your hands, and can’t remove dirt or grease. While using them isn’t an all-purpose substitute for washing with soap and water, it’s still better than nothing. Keep a small squirt bottle of sanitizer in your purse or briefcase. Many people also keep one in their car to use after pumping gas or before eating a fast food meal. If a friend or co-worker is sick, keep your distance. This is also a good time to step up the frequency of your hand washing and use of sanitizer. During cold and flu season, don’t feel obliged to shake anyone’s hand. Simply tell them that you’re keeping everyone’s health in mind. No one wants to get sick, so folks will understand. And if you do get a cold, stay home from work! Keeping your germs to yourself is the right thing to do. That’s why sick days exist, after all! Your immune system is a powerful entity, so treat it well! That means eating a diet rich in vegetables, fruits, whole grains, and other non-processed foods. Drink plenty of water, and get your eight hours or more of sleep each night. Self-care is important, so don’t neglect it. Keeping your body in tip-top condition will increase its chances of fending off a virus, or minimize its severity if you do come down with something. It really doesn’t take that much effort to stay healthy. By following cold and flu prevention steps like washing your hands often, eating a wholesome diet, and getting immunized, you can sail through the winter cold- and flu-free! Need to offer health insurance to your employees? Contact Semple Solutions today to learn about cost-effective health coverage.